Eli has been reading a number of vituperations on the involvement of NASA with climate science and renewable energy. Sadly to say some of them have come true including cancellation of the greenhouse gas monitoring program following the current administration's line of if it is not measured nothing can be done. One of the odder takes is that NASA GSFC and GISS, both named for Robert H. Goddard, who is the US pioneer of rocketry, must return to its Buzz Lightyear roots. However, a little searching shows that as is often the case with those who value their attitudes above understanding, that they are clueless and that Goddard was indeed the father of NASA climate science. It is well understood that the pressure, temperature, wind velocity, and moisture content, which obtain at the top of the troposphere, i.e., at the 10 km. level, would be of much importance in weather forecasting; making possible the prediction of surface conditions many miles distant from the place of observation. The data would obviously be of greatest value if obtained simultaneously at a number of separated stations. If this were done, an accurate weather map, representing conditions at a definite high elevation could be made, and compared with that representing surface conditions. Such a high altitude weather map would also be of obvious importance in aviation. In short, then, the most desirable method of obtaining high altitude data for weather forecasting, would consist in the sending of instruments to the 10 km. level daily, from a number of stations, the ascent and descent being as rapid as practicable; provision further being made, if desirable, for maintaining the instruments at this level during an appreciable interval of time. 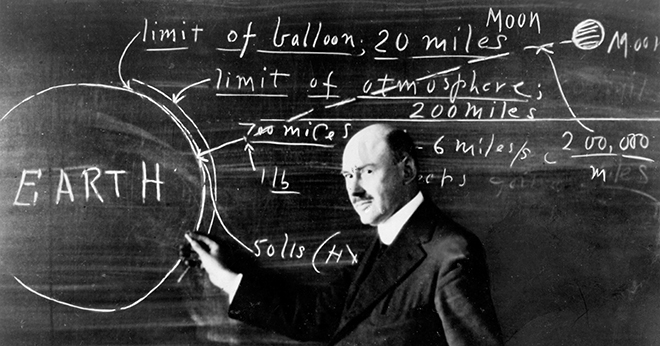 He was involved in testing instruments to be used to measure meteorological variables using sounding rockets as discussed in a 1920s letter to Science Magazine. In conclusion it may be said that, instead of being a necessarily inefficient heat engine, the properly designed solar engine may rival in efficiency and smallness of bulk any other type of heat engine that can be imagined. This results from the easy utilization of very high temperatures, together with low heat and frictional losses. Expressed in another way, the properly designed solar engine is capable of handling enormously concentrated energy, such concentration of energy making possible maximum heat absorption, together with minimum heat loss, and minimum size. An interesting feature of the solar engine herein described is an extreme of lightness, for a given power, which no other type of heat engine can approach. This results from the small size, possibility of using light materials, and absence of weight of fuel. 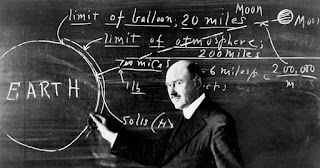 Eli shudders to think how Robert H. Goddard would have been described by Steve S Goddard, aka Tony Heller The Good Goddard was as a solar power enthusiast of the first water who developed practical and efficient solar powered engines and more. In 1929, he wrote in Popular Science about a small, 30 HP, concentrated solar motor he was working on that could reach an efficiency of 50% and be used to power large farms, with excess energy generated in the day being used to charge batteries. Goddard concluded that "The practical and obvious first use for the new solar motor however is to supply abundant and cheap power for mankind." It is--from a solar-energy development point of view --too bad that Colonel Lindbergh persuaded the Guggenheims to give Goddard $100,000. For, instead of devoting his time to solar experimentation, Goddard removed his equipment from Camp Devens where he had been conducting static tests and went to Roswell, New Mexico, for flight tests on his own proving grounds. "In conclusion it may be said that, instead of being a necessarily inefficient heat engine, the properly designed solar engine may rival in efficiency and smallness of bulk any other type of heat engine that can be imagined. This results from the easy utilization of very high temperatures, together with low heat and frictional losses. Expressed in another way, the properly designed solar engine is capable of handling enormously concentrated energy, such concentration of energy making possible maximum heat absorption, together with minimum heat loss, and minimum size. An interesting feature of the solar engine herein described is an extreme of lightness, for a given power, which no other type of heat engine can approach. This results from the small size, possibility of using light materials, and absence of weight of fuel." Great, a genius in his own field (rocketry), can be an absolute crackpot in another (solar). He's certainly not the first. There was Linus Pauling with vitamin C, Issac Newton's pursuing alchemy and Nicola Tesla keeping his head in his X-ray machine for some period of time each day. Note that C doesn't actually detail any mistakes Goddard made. He just implies them, hoping we will take it as given. "... may rival in efficiency and smallness of bulk any other type of heat engine that can be imagined...and minimum size. ... This results from the small size, possibility of using light materials,"
I let Goddard's own words hang him. Why didn't they put some of this "small sized" solar on the Cassini probe? I don't know...Maybe the IC engine on Galileo was paid for by Exxon? "Why didn't they put some of this "small sized" solar on the Cassini probe?" 1) Solar power density at Saturn is about 1% that of Earth. 2) Solar thermal need a heat sink as well as a heat source which is problematic in space. 3) Plutonium RTG was invented after 1929. Solar constant at Earth's orbit: 1361.5 watts per square meter (Kopp and Lean 2011). Semimajor axis of Saturn's orbit: 9.537 AUs. Solar constant at Saturn's orbit: 14.97 watts per square meter. Just as much to the point, planetary probes don't need sources of mechanical energy. 2. It's cold outside and there's no kind of atmosphere, which makes radiative cooling of thermopiles easy. Goddard the Unsteve's finest hour was developing a WWII rocket weapon far more important than the V2: the G.I. 's Great Equalizer , the bazooka. I reviewed David Clary's excellent 2004 Goddard bio, Rocket Man for the WSJ, and still recommend it. The biography that is , not the paper. There is a lot of ongoing interest in solar powered space craft, although I think as far as giant leaps go, anything beyond Earth orbit presents enormous challenges - for every known, existing or hypothetical space drive technology. Small steps aren't doing it. As for solar here on Earth - it is the fastest growing energy source. Subsidies can help explain how they developed so quickly but that growth of market share is due to being - even if intermittently and periodically - some of the lowest cost energy that can now be obtained. Goddard seems to me to have shown great foresight with respect to solar energy. Bucking the usual trend, I would say his expectations of wide scale solar energy are going to come true way ahead of his visions of colonising space. "California already has too much solar, top economist argues. As a result, "The 10,000th megawatt (MW) of solar we install will generate only about half of the value that the 2000th MW did."" And the last 10,000 megawatts may cost a quarter of what it does now and right now it is amongst the least cost options. I don't know how the near zero emissions endgame plays out - and nor does Shellenberger. I don't count Shellenberger as a "top economist" and "Lukewarmers" like him are, in my view, just as much climate science deniers as those who reject any physical link between climate and CO2. Underplaying the seriousness of the climate problem is the exact wrong tack if he is sincere about wanting it faced using the 'strongest' and most expensive, most politically problematic option. I admit I doubt he is sincere. I think he is nothing but a distraction and think his arguments, whether deliberately or not, work hand in glove with those of other opponents of strong climate action seeking to undermine the actions that others are taking, ie Renewable energy. He seems unwilling to confront the climate science denial that prevents the largest bodies of political support for nuclear from being mobilised. Ken, Shellenberger is referring to James Bushnell, not to himself. My Cassini probe comment illustrates how dispersed solar is, and how absurd it is to claim solar energy apparati have a small size. No, Canman, your Cassini probe comment illustrates that you didn't think it through at all, and now cannot even admit it. there is no such thing as "small sized solar"
panel area in the suburbs of Saturn than sunny LA. There's no such thing as small sized solar in those sunny LA suburbs either, not to mention small sized electricity storage. Canman, Shellenberger offers no way forward. It makes perfect the enemy of good enough - or better than nothing at all, but doesn't address the fundamentals at all. It might work in some imaginary world where we don't have to start from here and governments have the power to override all the competing interests. Under his verbiage Shellenberger's assumption seems to be that if environmentalists supported nuclear we would be well on our way to fixing the whole problem. I disagree, because the fundamental basis of opposition to strong climate action (enduring climate responsibility avoidance and near term cost avoidance) by commerce and industry would still remain unaddressed. A few more nuclear plants than otherwise would maybe flow from greater popular support for nuclear but when it gets to seriously displacing fossil fuels, the build rate will be inadequate; the real commitment just isn't there. Early climate/energy policy was mostly appeasement, not commitment, and would be appeasement with small and inconsequential programs supporting inadequate amounts of nuclear. The cashed up fossil fuel industry would not suddenly abandon all efforts to preserve their future profits because nuclear is more popular than renewables. Perhaps their pet Tankthinkers, in the absence of anti-nuclear activism, would have to invent it themselves. Or perhaps not; the economic alarmist fears of commitment to renewables at large scale probably works as well when applied to nuclear. Well I saY Shellenberger offers the best way forward. Everyone else just offers wishful thinking (Goddard bringing us small size solar?). Shellenberger understands them. He used to be one of them. He's moved forward. He's looked at and presented real world data. He cares about human well being. In his twenties, he went to places like Nicaragua and saw how poor people lived. There's no one else in politics like him right now. Shellenberger is the Cynthia Nixon of California. Naive, inexperienced blowhard backed by same.